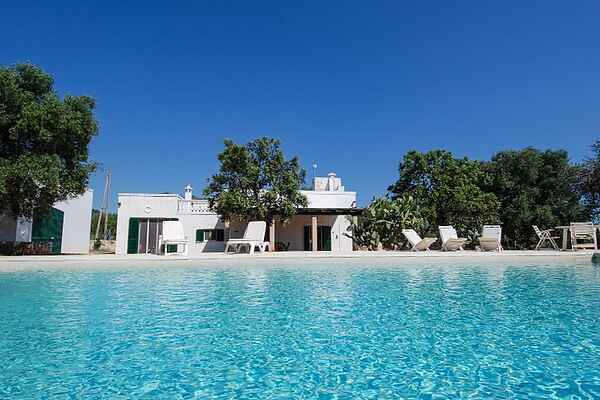 The masseria o is a fascinating and historic Apulian vacation home boasting a splendid private pool (14x7m) with three bedrooms. The masseria is surrounded by secular olive trees. The masseria has been restored with great attention to detail. It is fully furnished with rustic, timeless and tasteful furniture. Outdoor furniture has been updated. This vacation home is situated a few kilometers from the sea in the countryside famous for its timeless sights. It is surrounded by historical masserie and secular olive trees. The outdoor area is full of greenery and vegetation. It is enhanced by a beautiful porch with climbing plants, the large private pool (14x7 meters) is near the structure and there are a number of alcoves and hammocks around the garden. There is a laundry area and a large outdoor oven / barbecue. We suggest Masseria dell'Uliveto to families or couples of friends who are looking for an authentic and tranquil home located among nature and only five minutes from the beach.